On a quiet Sunday in September, we headed down to Church Street to check out Smith. The restaurant is in an old Victorian-row house on Church Street, slightly hidden from view. The only hint of the restaurant is a red marquee sign in the window spelling out the name. There is bar seating just outside the restaurant on the sidewalk. The restaurant is narrow, with twists and turns leading to the back patio which is one of the most romantic, cozy spaces in the city. The gate opens to overlook a park off Church Street. The benches are decorated with mismatched pillows of varying sizes and fabrics. The exposed brick wall is painted in sections and natural in others, giving a very industrial feel to the space. The tables are rough and rustic, reminiscent of barn doors. On our table there was an antique porcelain cabinet knob that was turn upside down holding a single sprig of lavender. It is simple and cute. The Benedict with poached eggs, parmesan leek fondue and home fries. Yes. Fondue should always be a topping not a dipping sauce. The parmesan leek fondue is nutty with the garlicky freshness from the leeks. It is thick and rich but does not overwhelm the eggs. This is an adult version of an already adult breakfast item. It is fancy without being stuffy and pretentious. It is fresh and tastes of spring. This would be the perfect addition to an Easter brunch. I ordered the Huevos Rancheros. The Huevos Rancheros with tortillas, poached eggs, black beans, guacamole, sour cream and salsa. Another perfect dish. This huevos rancheros is fresh and light but is packed with protein and flavour. The guacamole is creamy, as if it is blended with sour cream but maintains the lightness of a sauce. The salsa is chunky and fresh, allowing the fruitiness of the tomato shine through, with hints of spice. The tortilla is toasted and a strong support for the pile of food mounded on top but is still tender enough to slice through perfect bites of Mexican yumminess. The brunch was a bit pricey, but it is definitely worth it as a treat. I returned a few weeks ago for a Winterlicious dinner with a friend and it delivered just as much as the brunch did. I can’t wait for the return of warm weather so that I can return to this patio and enjoy a delicious brunch once again. The only appropriate way to kick off a cottage weekend is to go for brunch. Back in the summer, ampoule we headed up to Muskoka for some much needed rest and relaxation. Before we hit the road we went for brunch at Easy Restaurant. Nothing makes me feel more relaxed than enjoying some delicious food with my best friend and not in the midst of the usual weekend-brunch craziness. We went to the College Street location. The restaurant is filled with movie memorabilia, advice retro toys, ailment and heavily features images and posters from Easy Rider. It has a very chilled out, hanging out in your grandparents’ basement vibe to it – I was into it. It was cool without being pretentious and fussy and was accompanied by a great soundtrack. The menu was a mixture of Mexican flavours with brunch classics. I ordered the Huevos Divorciados. 2 sunny eggs on a corn tortilla with spicy green & red salsa, re-fried black beans with side guacamole, ancho jam, toasted baguette with home fries. I’ll be honest: when I ordered this I really thought it was going to be your regular huevos rancheros with a different name and maybe more salsa. Don’t be fooled, I actually know nothing about food. So you don’t make the same naïve mistake that I did, here is a description of the dish: Huevos divorciados, or “divorced eggs,” is a Mexican breakfast featuring two fried eggs separated by chilaquiles or tortillas. Refried beans with tortilla chips can also be substituted. One egg is covered in salsa roja and the other is covered in salsa verde. There you go! My dish delivered in all the way it was supposed to. The red salsa was fresh and summery, and the green salsa stood in sharp contrast with its spiciness and heat. I liked that the beans on the eggs were refried but in their original form, rather than a mash but you still had the option of a more dip-style bean on the side of the plate. The eggs were perfectly cooked sunny-side up: the yolk had just started to solidify on the bottom into a creamy thickness but the rest of the yolk was still runny on top. The guacamole was delicious. It did not have tomato, which I prefer because I find tomatoes make the guac watery. It had the right amount of garlic, and zesty citrus flavour. My favourite touch: that it was served with baguette instead of tortillas or regular bread. Delicious. GC ordered the Guacamole BLT. The Guacamole BLT with crispy bacon, guacamole, tomato, and greens on a whole wheat panini with home fries. This was a delicious and cozy brunch. The flavours were fresh and summery. This is the perfect brunch for feeling summery and starting a cottage weekend. It would also be the perfect brunch to enjoy on a cold winter day similar to what we are experiencing now. This is not my favourite brunch in the city but it is a solid choice and the price is right. It may not be in my Top 10 but it would grace the Top 20. If you are looking for a relatively greasy, Mexican-ish brunch, Easy Restaurant is the perfect choice. After we brunched, we drove north and enjoyed a relaxing weekend on Georgian Bay. The weekend was perfect: good food and drinks, a steam, a black bear and even better company. I would recommend that you have a weekend like this too! Happy munching!! Happy birthday to me! This year marked a milestone birthday for me – I turned 25. I am officially in a new age box on surveys: 25-34. My birthday didn’t send me spinning into a quarter life crisis. Instead, viagra I took the week off and celebrated. I kicked off my birthday celebrations with Thanksgiving and then eased into the week with a visits to Playa Cabana Cantina with GC and my sister Amelia. Playa Cabana Cantina in the Junction has a much more chilled out, site hipster vibe then the original location on Dupont. The décor is a mixture of vintage, fluorescent lights and rustic textures and materials. It feels like a western Tex-Mex saloon circa 1967. I have plans of hitting up their late night taco special (after 10 pm Thursday-Sunday 3 for $12.00 tacos) with a few drinks sometime in the near future. We started off with an order of chips and guacamole. The guacamole was good – it was a little too creamy for my personal taste but the chips were fried to crispy perfection and salted with just the right amount of salt. Amelia and GC ordered the same tacos: the Pescado, Ancho-Braised Shortrib, and the Venera Frita . I ordered the following tacos: the Pollo Tinga, the La Truck, and the Ahi-Tuna. The pollo tinga was completely drenched in a sauce that was spicy but flavourful. The chicken was shredded and fell apart with each bite. The crispy tortilla held up against the weight of all the toppings. The guacamole was smooth and silky, a nice contrast to the texture of the chicken. The onion gave off a different kind of heat than the chicken offered and the cheese added another level of creaminess. This is the perfect chicken taco. It has inspired me to look up my own pulled chicken recipes to use this winter in my slow cooker. If you have any recommendations let me know! The la truck taco was a steak taco. The steak was diced into perfectly bite-sized pieces. The steak was tender, juicy and had hints of barbecued smokiness to it. The slaw on top offset the richness and heaviness of the taco and had hints of citrus that were further brought out with the squeeze of fresh lime. This may be the best steak taco I have ever had. The ahi tuna taco was good but not my favourite fish taco; that title still belongs to La Carnita’s “In Cod We Trust”. I found the taco lacked any sort of further flavor besides the fish taste. The tortilla was too small and overloaded; it literally crumbled under the weight of the deliciousness of the taco. However, as there was a fork and knife at the table I was still able to munch all this goodness. After our lunch at Playa Cantina, it was decided that we all prefer it to La Carnita – shocking, I know. La Carnita will continue to hold the title for my favourite fish taco and I will continue to visit it but Playa might turn out to be my go-to Mexican restaurant in the city. Brunch in Toronto can be a gruesome undertaking. Most restaurants do not: open until late morning, clinic take reservations or offer other options until mid-afternoon. The last point really irks me because if I go out for food after 1 o’clock, seek I want lunch not breakfast. That being said, pharmacy despite the above and my less than enthusiastic feelings towards breakfast, we have officially become people who brunch. We are trying to cut back on going out for food (which greatly pains me) and in tandem with that, we are trying new places. As most of our free time together is weekend mornings and afternoons, we are people who brunch. A few weeks ago we had brunch on the patio at El Catrin. El Catrin has an amazing patio. It is unfortunate that we are slowly edging out of patio weather and many of you may have missed this patio because it is worth a visit. But put it on your list for next spring! I love the combination of bench, chair and stool seating, the large fire pit in the center of the space and the mixture of textiles, materials and colours that give this patio a very bohemian, Mexican/Spanish vibe. We started with a round of margaritas because all brunches should include booze of some sort. I think my affair with tequila may be over. The past few times I have had tequila shots, margaritas, or other cocktails with tequila, my stomach cannot deal. I think it is the amount of citrus that throws me off and leaves me feeling incredibly nauseous. Regardless of my dainty stomach, these margaritas are delicious: salty, tangy and with the perfect woody kick of tequila. We then had guacamole and chips. I found their guac a little more about the theatrics rather than actual taste and quality. They bring over the fresh ingredients in a mortar and pestle and mix the guac tableside. This is a fun, interactive component of the meal but do you really need to prove to me that you are using authentic, good-quality ingredients? Shouldn’t your food speak for itself? Because of its presentation, I had higher expectations for this guac and it feel slightly short. I did like that the guac wasn’t perfectly smooth, I like a little chunk and texture to my guac. GC ordered the Omelet Machado Con Pollo. Chipotle braised chicken, green onion, tomato, green bell pepper, and salsa verde. This was an insane amount of food. I understand that brunch is supposed to set you up for the rest of the day and ensure you aren’t hungry until dinner but omigosh did this omelet do that and more. The chicken could have been a bit spicier and better shredded but the vegetables and salsa were the perfect bit of freshness to pull the omelet together. I order the Huevos Rancheros. Three fried eggs over a corn tortilla with salsa roja, garnished with black bean puree, guacamole. I love, love, love this dish. The tortillas were warm, salty and slightly crunchy, being substantial enough to hold up to all the mounds of Mexican goodness on top, but soft enough to be cut into perfect bites. The eggs were fried nice and crispy but ensured that the yolks ran beautifully and golden all over the plate. The black beans were slightly sweet and nutty and had a nice gritty texture to them. They were pureed but not pulverized, and served warm. I could have eaten just these beans. The salsa had a nice bit of spice to it which kicked up this dish and made it taste truly Mexican. Overall, this is good Mexican food with great cocktails and ambiance. A little bit on the pricey side but, given that you are in the Distillery District, you can’t be surprised. I am waiting for the opportunity to arise when I can go back for dinner and enjoy the interior of the restaurant. Before Easter my sisters, order GC and I went for dinner at Milagro. Top left, clockwise: Tacos Rosarito with sauteed shrimp, refritos, crema, aguacate and salsa rosarito. Trio botanero: guacamole, refritos and pico de gallo. Tacos la Perla with battered snapper, tropical slaw, and chile crema. Panela Burrito with arroz, refritos, guacamole, chipotle-mayo, jalapeno and fresh cheese a la plancha. As per usual, everything at Milagro was delicious. Highlights for me included the refried beans (both on their own and in tacos), the housemade tortilla chips, the shrimp in the rosarito taco, and the corn that came with the burrito. Next time, I swear, I will order something other than fish tacos. I had first heard about Grand Electric from my sister’s friend, Catherine. Years ago, Catherine had travelled to California and fallen in love with fish tacos and had been searching for the Toronto equivalent for years. Her favourite fish tacos in the city are from Playa Cabana and she has yet to try Grand Electric. I feel slightly terrible for trying this suggestion without her (and without a few other people I had promised after that) but now I can tell her (and them!) that it is delicious! Grand Electric is one of the more exclusive and sought after restaurants in the city. It’s exclusivity is not attributed to price, but rather size. It is a tiny little restaurant that jams in about 25 people and slightly more during the summer on their patio. Crowds of people are drawn to this restaurant due to the legend of their tacos and will wait outside in the snow and rain in hopes of getting a taste of these legendary tacos. To avoid the crowds and ensure that we would be able to try all the deliciousness that Grand Electric promises, GC and I had lunch on a Sunday and the restaurant was tightly packed but with no lineup outside. If you hate hipsters you should definitely not visit this place. There are records on vinyl, antlers, craft beer and thick, plastic frame glasses everywhere. It is your grandmother’s 1970s basement meets hunting lodge meets Mexican food. A too cool vibe which is the perfect setting to enjoy some delicious food. I make it a point to try the guacamole at every Mexican restaurant I visit. No, this guacamole was not radioactive and poisonous, it is just a camera flash being slightly too powerful. This guacamole was exactly how I like my guac – half creamy and smooth, half chunky and dressed with a little bit of cilantro, garlic and lime. There is no need to put tomatoes in guacamole. It causes the guac to become too running and adds to much sweetness which takes away from the sharp acidity from the lime and cilantro and the vampire kick of the garlic. You can get your fill of tomato from the salsa on the side which was slightly chunky and had a great amount of heat – the perfect following act to the headliner guacamole. The chips were WARM! I am not highlighting this as a point of anger but rather a point of deliciousness! It brought out the corn flavour even more and highlighted that Grand Electric means business – fresh, homemade ingredients coming together to make a delicious meal made to order. Grand Electric, like La Carnita, allows you to order tacos individually, allowing us to try 5 different tacos that day. Top left, clockwise: Spicy Arbol Chicken taco, Scrapple taco, Beef Check taco and Pork Tinga taco. The chicken taco was spicy, warm and tender. The chicken was perfectly cooked and the pickled cabbage brought out the sweetness in the marinade. Scrapple is something neither GC or I had heard of so obviously once it was described one of us had to get it. Grand Electric does their scrapple by boiling down the head of a pig until the meat is tender and falling off the bone. Then this meat is formed into a loaf along with other ingredients and then cut into slices and fried. The result is fatty, salty, juiciness wrapped in a light tortilla. Who knew the face of a pig could taste so good? This beef cheek taco was unbelievable. The meat was tender, falling apart but maintaining all its flavour. It was rich, deep and decadent. It was smoky and crispy. The toppings of guacamole, cilantro and jalapenos were the perfect trio of flavours to match the boldness of flavour that was found in the meat. Apparently some of the best flavours in an animal are found in its face. The pork tinga tacos had all the qualities of the beef cheek tacos but with pork instead of beef. The crema made this taco even more decadent and rich, with the pork and crema battling for the tastebuds in your mouth. And of course, the reason for coming, the fish tacos. These have become an area of contention between me and GC. GC loved these, I thought they were just okay. We agreed that the toppings were the perfect compliment to the fish and the sweet, crunchiness of the cabbage slaw paired well with the crema and the heat of the salsa. The issue for me came from the fish itself which is the reason GC loved them. The fish reminded me of the fish in fish & chips, not the fish you should find in a taco. The fish in fish & chips is about the breading – it is greasy, crunchy and consumes the flaky, delicate nature of the fish. In a taco, the fish should be lightly breaded, adding a slight crunch rather than an overpowering CRUNCH. If that’s how you like your fish then you will love these tacos. Unfortunately I did not. 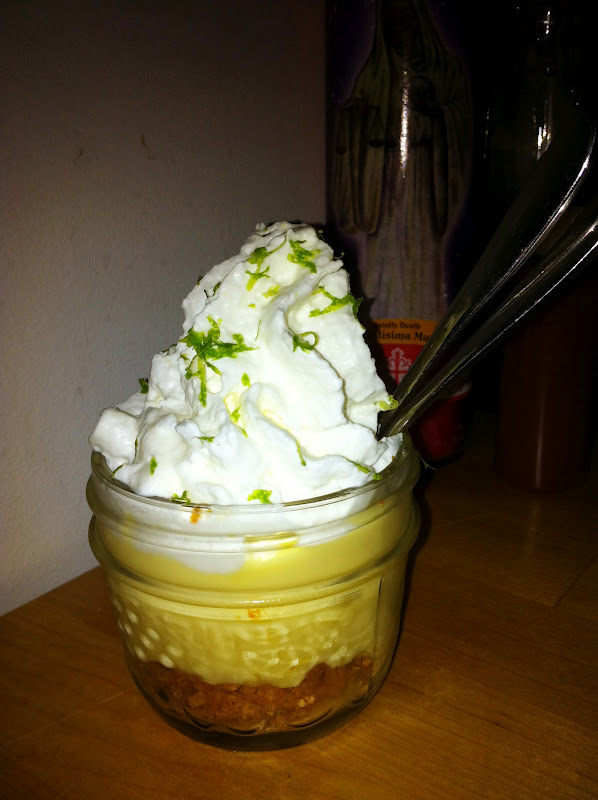 We finished off with a little dessert, a keylime pie in a cup. This is the perfect cup of dessert. The whipped cream was homemade, light and airy. The key lime itself was sweet, thick and completely luscious. It felt like such an indulgence and complete extravagance to eat something to velvety smooth and sweet. The crust on the bottom left little to be desired. It did not taste like a good graham cracker crust mixed with butter and sugar but just like crumbs that had been smushed into the bottom of the cup. But after several spoon fulls of the key lime I really could have cared less. If I am in search of fish tacos (and more accurately, feeling lazy), I will be sticking with La Carnita. If I am craving Mexican food, whether it be guacamole, tacos or key lime pie, I will be going to Grand Electric! A few nights ago, GC and I had a “Treat Yo’ Self” (inspired by Parks and Recreation) night where we went for pedicures and then out for dinner. We go to Pedimani Nail Spa on Yonge St (if you care, which I doubt you do), just north of Lawrence. Close to home but more importantly and, why I mentioned what neighbourhood we were in, close to tons of great food options. The options are seemingly endless: burgers, BBQ, sushi, Mexican, Italian and frozen yogurt. We are slowly going to munch ourselves up this stretch of Yonge on our “Treat Yo’ Self” nights and we started with Milagro.